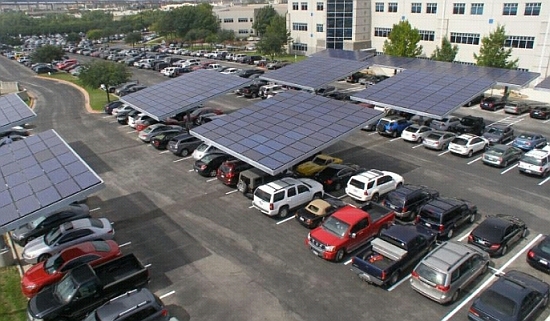 Eco Factor: Solar energy generating car parking will generate 130,000KWh of green electricity annually. Envision solar has announced the completion of a solar shaded parking structure at Dell’s headquarters in Round Rock, Texas. Called Solar Grove®, the system is designed to produce over 130KW of green power, which will help avoid 65 tons of greenhouse gas emissions annually. The solar farm consists of 516 photovoltaic panels from BP Solar and was constructed by McBride Electric Inc. and Envision Solar. The structure will provide shaded parking space to 50 cars and carries two solar charging stations for plug-in electric vehicles.